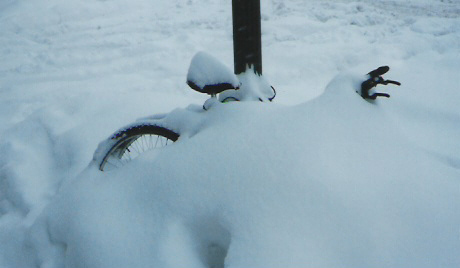 I took this image back in 1996 during a large snowstorm. Went out walking with my camera. That was a bigger snow than our recent one. In 1996, we had over 3 feet of snow. Today it is around 8 inches in town and 15 inches in parts of the county. Still a lot of snow for Bellingham as some years it hardly snows at all. Most cars are not prepared with snow tires in this area. Glad I live within easy walking distance of my job and errands. The freeway had a big slowdown headed northbound. I was in my cozy room listening to the radio. They were directing people to some back roads, like Colony Road and Ershing Road. Callers had no idea where said roads were. Those are roads I often take on my bike. I guess I know back roads better than people who seldom leave the freeway. Being able to walk to work, I helped tidy up another co worker's area who wasn't able to make it in yesterday. I often have trouble driving because I only know the back ways -- somebody tells me to take Freeway 280 to the Almaden exit and I get completely turned around and lost. Not only that, some of my back-road ways also involve short cuts through alleys and pedestrian/cyclist facilities.